Subject to US Air Force Academy access restrictions, ID is required. Auto access from the North Gate of USAFA only. Entry via car may be subject to a look inside your vehicle. Please don't hassle the guards, they're just doing their jobs. 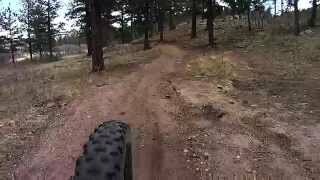 This fantastic singletrack loop trail tours the grounds of the US Air Force Academy. Rebuilt about ten years ago, it boasts long climbs, flowy singletrack downhills, and beautiful views as it crosses high prairie and low mountain woodland terrain. A couple of short, moderately technical sections add interest. Rideable by advanced beginners, it's still a favorite of the veteran riders in town. 1. Photo IDs are required on the USAFA. Although it is improbable that you'll get stopped by the Security Police while riding, the weight savings would not be worth the mind-boggling hassle that would result if you were stopped or if you got injured. Play it safe and ensure that you always carry a government-issued photo-ID. 3. The USAFA is closed to non-DOD visitor traffic after 5:00 p.m., so plan accordingly. See usafa.edu/visitors/getting-… for details. 4. Finally, access is restricted during USAFA Football games, so check online to ensure you avoid these times. This is one of the best known and ridden loops in Colorado Springs. Most commonly, riders start at the main trailhead located immediately north of the US Air Force Academy's football stadium. Although it is feasible to start at the nearby B-52 monument, the connector between the B-52 and the main loop is not well-maintained. The main trailhead is now located just over Academy Drive, north of the stadium. This trailhead is recognizable by the number of trucks and SUVs with bike racks parked helter-skelter in the gravel lot. The actual trail emerges from the treeline immediately west of the parking area. No matter which direction you go, the trail is 95% singletrack and all on dirt. 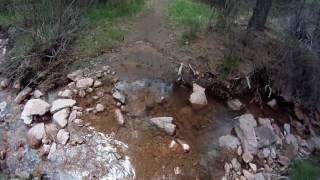 The trail covers rolling terrain, with climbs and fun descents. You'll end up generally climbing to the high point on the west side of the Academy grounds, about 1,400 feet above the start of the loop. There are a few road and stream crossings, but it's hard to miss the trail. From there, it's mostly downhill, with a few climbs to keep you honest, back around the loop to where you started. Traditionally, the Falcon Trail (FT) is ridden in the clockwise direction to avoid too many sudden head-on meetings on the fast descents, although it can be ridden both ways without incident if one is attentive. When starting from this trailhead in a clockwise (south) direction, the FT immediately starts to climb gradually up through a pine forest behind the USAFA Football Stadium before climbing up and down over several ridgelines. After crossing Pine Drive, the trail descends towards West Monument Creek, which it crosses several times over the next three miles. This portion of the trail has been much improved since ~2015 with multiple bridges and strategic reroutings to avoid worn-out areas. One new improvement is a split in the trail labeled "The Easy Way" (called here the Falcon Trail south spur) that gives riders the option to avoid the one small technical section on the FT. That said, riders should be cautious during springtime or rains, because this spur requires several stream crossings which 99% of the time will result in wet feet or worse. 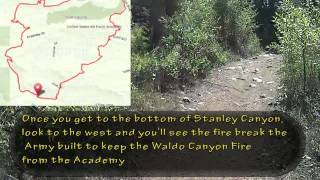 From West Monument Creek, the FT climbs via several switchbacks to its highest point at the Stanley Canyon Trail. From that point, the trail is characterized by several fun, curvy descents and shorter climbs that eventually brings you back to the Main Trailhead. 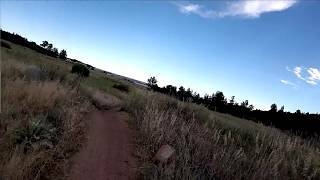 The trail concludes with a nice flattish cruise along the USAFA Golf Course. Once you finish your loop, just head back out to the car. If a 13-mile loop isn't enough, many people do another lap in the other direction. The ride feels very different going the other way, but it's tough to say which way is "better". Originally a private ranch, the US Air Force Academy was built in the 1950s. The Falcon Trail was rebuilt in the early 2000s to IMBA standards. Oct 1, 2017: End of Trail Season Hootenanny! 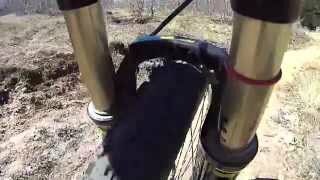 Great singletrack with a good climb and one or two technical sections. Great fun ride with a nice climb. Criusey and casual. killer track! one of the best around town. great views! Sandy conditions reduce the fun factor a bit on the climbs, but there are nothing but smiles to be had on the descents. Rode CC from the B-52. Short stop at the top. Finishing the tough Stanley Canyon climb. An afternoon ride on Falcon Trail. Overlooking Falcon Stadium from the trail. One of the more crowded days on Falcon Trail.